The early bird gets the worm. The same holds true for trade shows — the most successful exhibitors are those who start planning at least 12 months prior to the next event. Exhibiting requires a great deal of time, money, and personnel. Make the most of your resources by utilizing them at the show that best meets your marketing needs. But how do you know what show is right for you? Here s a hint: It s not necessarily the one with the largest ads in the trades or the one that is offering deep-discount exhibit space. Instead, ask yourself these ten questions about the shows you re considering, and you ll soon discover which are right for you. 1. How well does this show fit our marketing needs? This is the paramount question. Exhibiting at a show must clearly fit into your marketing strategy. Whether you are planning to launch a new product, expand into a new geographical region, or reach out to reinforce existing consumer relationships, every show should have a well-defined goal that is an integral part of your marketing plan. 2. When is the show? Show timing is crucial. Not only should an event be convenient for you and your staff, it should not be in conflict with other major industry shows or events. While there is a seemingly endless supply of competitors out there, there is only a limited amount of customers. They have to pick and choose what shows they ll want to attend. Don t undermine your chances by exhibiting at a small show that conflicts with the larger event that everybody goes to. 3. Where is the show? Location is everything. Some events purposely locate at destination locations such as Las Vegas or Orlando to entice attendees. There is some validity to this strategy, although you want to watch against the tendency to attend a show because of the amenities nearby. You’re sending a team to sell your products and services, not to visit SeaWorld or gamble the night away. 4. Who comes to this show? A show must attract your target audience. Use attendance data from previous shows to determine what percentage of attendees are likely to be interested in your products and services AND are from your major service areas. It s no good presenting your products to an audience that you can t sell to. 5. Who else will be there? 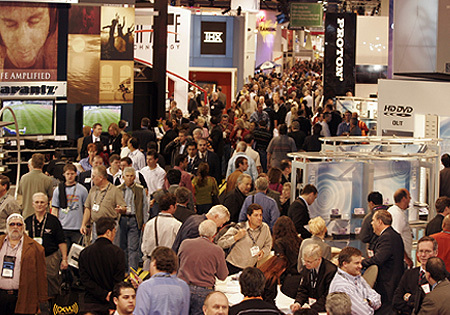 You will want to know which and how many of your competitors will be exhibiting at a particular show. Remember, you need to be visible to be memorable! If you are not in front of the public, and your competitors are, the public will remember your competitors and not you. However, a savvy marketing strategy might be to exhibit at a show that attracts your target audience but is outside of your immediate industry. 6. How successful is the show? While individual success is the responsibility of each exhibitor, there is a great deal that show management can do to ensure a high quality show. Discover what organizers do to promote the show, and take a look at previous shows. Ask for a list of previous exhibitors to contact about the show and ask them for their thoughts. Would they exhibit again? 7. Has someone from my organization actually visited this show? A first-hand perspective from someone who fully understands your marketing goals and objectives can be an invaluable tool. Do they think the show is a good fit? Ask them about show logistics. Did things appear seamless, or were there some rough edges? 8. How much does the show cost? Participating in a show can be expensive. Make your decision only after looking at some real life figures. Add in every expense affiliated with the show, not just registration fees. How much will it cost for items such as signage, graphics, literature, travel, lodging, meals, giveaway items, etc? And, don t forget to calculate your indirect expenses your people s time away from the office. 9. What kind of help will we get? Ask show organizers about promotional assistance. Are there sponsorship opportunities to raise your company’s profile at the event? What types of media are being invited? Also, ask for audience quality information before you decide. Are the attendees the type of attendees you want to meet? 10. What return on investment can be expected from this show? Return on investment will in part depend on what your goals are for any given show. If you are concentrating solely on lead generation, and do not plan to be doing any selling at the show, return on investment will appear to be lower. It may take several weeks, months and even years for those leads to generate sales. However, with that in mind, set a benchmark ROI, or ROO (return on objectives) that your company would like to achieve from participating in the show. Does this mesh with reasonable projections?